The Arcades – Who’s Most Lost? The Arcades (after Walter Benjamin’s work), a long slow collaboration between myself and David Prior, will release its first album – Who’s Most Lost? – later this year on Rattle Records. This is very very nice news, not least of all because we’ve worked on it for so long. 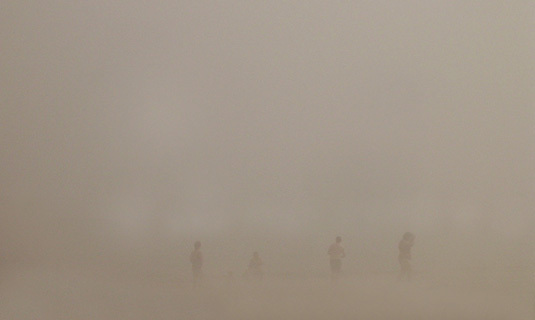 The cover art may well feature this image, the haze and ambiguity of which gives some loose sense of the concerns of the album. I’ve got a monthly slot on Radio NZ Concert’s “Upbeat” show, produced by Jeremy Brick and hosted by Eva Radich. The first one was broadcast on July 28 and has been archived here. It’s an introduction to soundscape and features Francisco Lopez’s La Selva (though I didn’t mention Lopez’s distate for the concept of soundscape…), David Dunn’s Chaos and the Emergent Mind of the Pond (the sublime rhythmics of aquatic insects), and what might well be the first soundscape composition – or the first work of musique concrète for that matter – Walther Ruttman’s Wochenende, “a film without images” dating from 1930, which is an aural counterpart to his silent film symphonies. The topic for the next show is yet to be decided. Perhaps a look at the work of instrumental composers who have incorporated the soundscape into their work in various ways? Berio’s Voci and Naturale come to mind (if we can accept folk songs as a kind of soundscape), as does Stockhausen’s Orchester-Finalisten (Robin Maconie maintains the instrumentalists play the parts of insects in this piece) and, something more recent, Fennesz’s Black Sea which weaves in and out of field recordings. And of course something by Messiaen featuring birds, though the only technology involved in such works was pencil, paper, and Messiaen’s formidable powers of listening.